The event was recorded by FloTrack, you can watch this 400m race with a MileSplit Universal account. Athing Mu of the Trenton TC had a big weekend during the talent heavy VA Showcase in Lynchburg, VA. Her first performance on Friday during the 400m dash already made the trip an instant success, crossing the line at 52.55 to move her up to fifth all-time indoors on the national high school rankings board, the sixth fastest time ever run. Still a junior this indoor time is only .05 off her outdoor best of 52.45! Then she followed that up with a New Jersey state record and US#2 all-time run in the 600m when she won at 1:28.54! Mu is already a decorated 800m runner but this was her first competition at this distance. Her 200m splits were around 27.5, 59.2. The National record is a 1:27.13 by Samantha Watson in 2017. The state record she demolished was a 1:29.27 held by Janine Davis since 2005. During the 400m she held off some strong competition that no doubt helped push her to the great performance, with Kayle Davis second at 53.30 and Kimberly Harris third 53.58. These girls were three wide on the final back stretch and came through the first 200m round 24.6 pretty much together still battling for position after the lane merge. 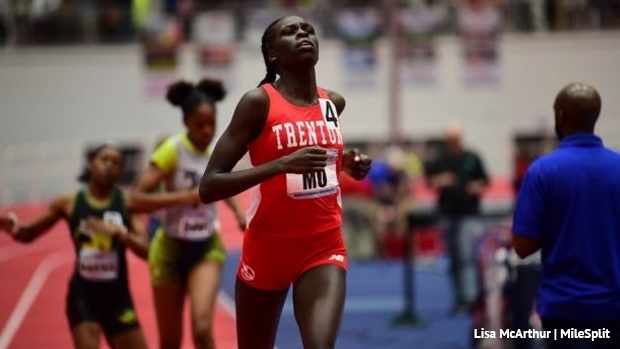 New Jersey now has two athletes in the US top five all-time for the indoor 400m and 600m. Sydney McLaughlin holds the 400m National record in the event at 51.61, as well as the second fastest time ever run at 51.84. The previous 600m state record holder Janine Davis is ranked fourth all-time now with her 1:29.27.